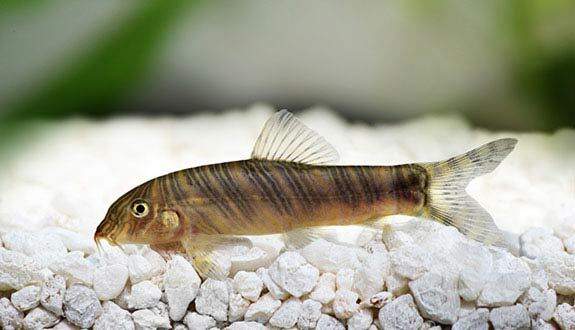 The Zebra Loach is the smallest of the loaches. Peaceful and rather nocturnal, it can be maintained in community aquariums if its needs are met. Find out here how to take care of your Zebra Loach! How to feed the Zebra Loach? Omnivorous: all forms of food are accepted with a clear carnivorous tendency. What kind of behavior does the Zebra Loach have? Gregarious, these fish must imperatively coexist with their congeners. If the group is too small, the Zebra Loach will become territorial with these congeners. However, this species is the least aggressive of the group. This fish is peaceful but yet very lively and even comic! Zebra Loach lurks most of the day and is active rather in the evening and at night. Who can live with the Zebra Loach? The Zebra Loach are quite peaceful fish and can be introduced into a community aquarium. Nevertheless, there are some exceptions to respect. For example, do not combine other bottom fish such as Corydoras, or fish that are too small or too cool, that may be frightened by its active temperament. Shrimps are also to be avoided because they will serve as a meal. Finally, the Betta, Guppy and other Cichlids with large fins will be able to nibble their beautiful sails by the loach. The Danios, barbs Pentazona, Garra, Epalzeorhynchos, Crossocheilus, Otocinclus or the likes of Luciosoma, Barilius, Balantiocheilos, Barbonymus, will, however, be good companions. How to breed the Zebra Loach? Extremely difficult (only possible using hormones). Which aquarium for the Zebra Loach? The aquarium of a Zebra Loach has imperatively a substrate of fine sand non-cutting. This species likes to stay for long periods in the shade. For its well-being, it will therefore be necessary to provide many hiding places and caves for it. For example, you can use rocks with non-cutting edges, roots, branches or even inverted flowerpots! To complete your decoration, you can attach plants such as Anubias or Java Moss (plant densely in general). The hiding places should not be too narrow because the fish could be stuck there. Attention also to the stability of your decoration. To sift the lighting, you can install floating plants that will pleasantly shade your aquarium. This species will appreciate a good current and a rather fresh water. Powerful filtration will ensure the current, waste disposal and oxygenation of the water, essential to the proper balance of the Zebra Loach. Renew also 30 to 50% of the water each week. It’s the smallest of the loaches! It is nevertheless quite close to its cousins from a behavioral point of view. It often eats snails but should not be sold just to cure a snail problem. Indeed, one must take into account its adult size, its gregarious instinct, its longevity and its temperament before buying a Zebra Loach! It has several pairs of barbels that it uses to find food by digging the ground.